“…as everyone knows, if the first butterfly you see is yellow the summer will be a happy one. If it is white then you will just have a quiet summer. Black and brown butterflies should never be talked about – they are much too sad.” Tove Jannson, ‘Finn Family Moomintroll’. I could even ‘see’ the old picture of Moomintroll and the Snork Maiden, sailing on clouds and, perhaps because of the underlying chill in the air, thought of the poor old Groke, a creature of darkness and ice whose passage froze the ground beneath her. I remembered another of Jansson’s illustrations; always misunderstood and inspiring fear, the Groke was chased away whenever she appeared, as unwanted as winter. Yet for all her unlovely appearance and her unintentional freezing of everything she touched, the Groke herself sought only light and warmth… and an end to the loneliness of her existence. I always felt sad for her. Something nagged at me about that. It certainly wasn’t her appearance that upset the residents of Moomin Valley; given the rest of Jansson’s illustrations, the Groke should have been right at home. She didn’t bring fear deliberately either… no-one can be held responsible for the mechanics of their physical nature. It is no more the fault of the bird that it flies, than the fish is to blame for swimming. Was her desperate quest for warmth and light overpowering? Was her lonely sadness too much to bear? It is possible… the pain of another often makes us uncomfortable. But those attributes were not a deliberate act on the part of the Groke, but a reaction to her own circumstances. Maybe it wasn’t her that was the root of the problem. Perhaps it was simply her presence? Maybe it was the reactions of those who pushed her away that were really at fault? Reactions based only upon assumptions and partial knowledge… and the way her physical being interfered with the lives of the residents of the Valley. It meant that she was ostracised and isolated, thus compounding the problem and increasing her sadness, creating a vicious circle. With a touch of tragic irony, it may even have been the actions of the enigmatic Snufkin and his magic potion that created the Groke in the first place. Dripping the potion onto an ant, it became a Groke, perhaps the Groke… and an ant, after all, is the most social of creatures and comes to life in the warmth. I don’t suppose for a moment Tove Jansson had such irksome ideas when she created her characters. She wrote weirdly wonderful children’s books that many of us loved and remember with fondness. Jansson wrote and illustrated the first of the Moomin books in 1945 as a reaction to the depression of wartime. She wanted to write something ‘naïve and innocent’ and in that she succeeded. They remain some of my favourite childhood tales and my granddaughters are now collecting her books… even if they haven’t realised it yet. All the best books have something to teach and children’s books particularly so. It is sometimes only when looked at through the eyes of adulthood that those lessons really become visible… and the spark that illuminates the lesson must come from our own observations and experience. We put the faces and forms of those around us into the stories that we read as a child… and it is then that every storyteller becomes their own illustrator. 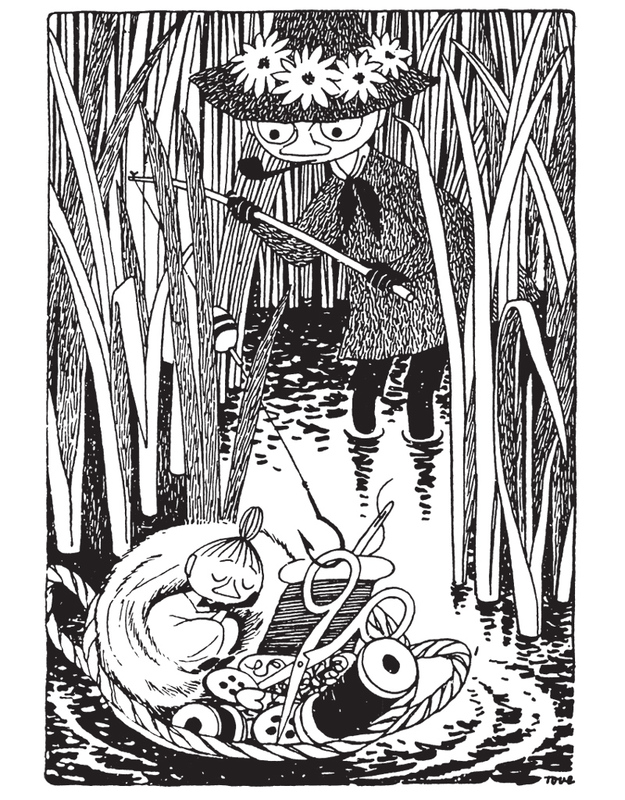 All images by Tove Jansson. The final image is her self portrait. This entry was posted in Art, Books, fiction and tagged appearances, children's books, hattifattners, misunderstanding, Moomins, ostracised, Snufkin, Sork Maiden, the Groke, Tove Jansson. Bookmark the permalink. One of my favourite authors, right up there with Maupassant and Thomas Hardy, as presented by Sue Vincent. Thanks for posting this, Sue. I needed a Moomin shot. I wanted to find our Moomin books because I thought the youngest ought to have read Moominland Midwinter by now, but I can’t find the box they’re packed in. The first butterfly here we all saw was a big yellow one. My eldest granddaughter gorgeous Moomin, Mymble and Little My for Christmas. I have never lost my childhood dream of wanting to live in Moominland. It was a close call, but as a got older, strangely I felt more drawn to Moominland. Liked the people better, I think. That doesn’t surprise me. I always wanted to see hattifatners. It was the small beasts with bows in their tails that fascinated me, and Little My of course. Snufkin was the one that got me.. I’ve met a few Snufkins over the years, and they are just as fascinating in ‘real’ life. I’ve known one. I have no idea where he is now. I lost track of all mine too… bar one. I think that is the nature of Snufkins. Yes, you can’t have a Snufkin who’s predictable and safe. They are the kind of people who are here today gone tomorrow because it seemed like a good idea. And leave behind them a trail of uncommon wisdom. I’d never heard of this children’s author before – very interesting! I shall have to consider her when I buy books for my friends’ children. I especially enjoyed the Groke story. They are brilliant books, with lots of lazy summers and just enough of a scary edge to delight children. What a beautifully written piece, Sue! Very insightful. I recall the characters as a child. Thank you. Childhood stories seem to have the power to wake the child that sleeps in all of us somehow. Lovely post Sue. Nice to be transported back to childhood. For some reason I was deprived of the Moomin books when I was a child. It’s odd because my parents and relatives were generous with gifts of books as I was a voracious reader but somehow no one bought me any Moomin books. I don’t even remember coming across them in the library. I was an adult before I heard about them. I don’t know if I’ve read any of Jansson’s work. I know I haven’t read about the Moomins. I think I too would have felt sad about the Groke. The books sound delightful. And I’m happy to hear about the glimpses of spring in your neighborhood, Sue. It will be welcome here too. I have no idea what you’re talking about. Does anyone else? I have not heard of these books before, Sue. They sound very interesting. They are brilliant children’s books, Robbie. Did the Groke ever get her happy ending? She had her moments. She put out a wildfire by sitting on it and freezing it out… and was suddenly much appreciated. Heh, Cool! 😀 …I think I’m going to invoke her for this coming summer. We’ve had two in a row with atrocious wildfires, I’d like to avoid a hat-trick if at all possible. I love these books and shared them with the boys. For some strange reason this brought sad feelings. Thinking of the Groke she reminds me of me inside ..
Sue, I feel like I’ve missed something. I’ve never heard of Moomins or of Tove Jansson. This is such a lovely post. I never read the books but watched the sinister TV show (the one before the cartoon). That was awesome! The books have that same, slightly sinister edge… perfect for small children who enjoy being safely scared but who always need a happy ending. My aunt brought me “Finn Family Moomintroll” after a trip to Cuba in the 1970s. The book was translated into Spanish in Cuba and in my opinion, it is superior than the English translation. Anyway, I was obsessed with this book and read it many times. No other book surpassed this one in my young mind. I still to this day go out on the first days of Spring, to find my first butterfly. This causes me some anxiety because here in Florida, we have a LOT of brown butterflies. Today I saw my first Spring butterfly. It was blue. I hope this is a good sign! Thank you for the memories of this wonderful book.